When it comes to Soviet or Eastern European armored vehicles, WWP has become one of the leaders and this book is no exception. 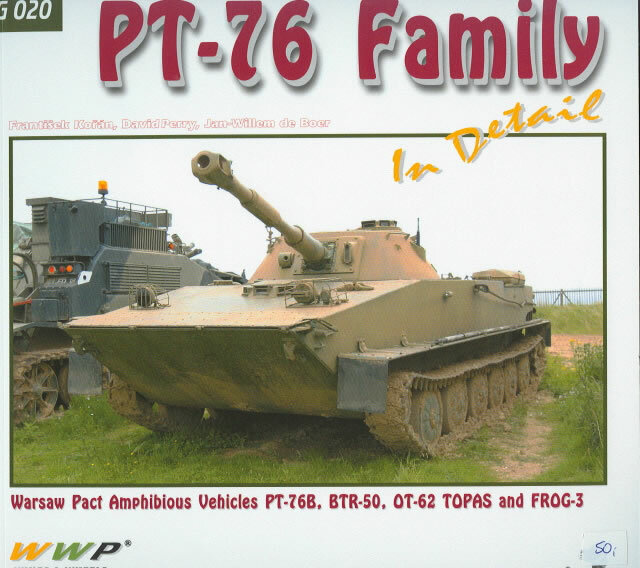 With the advent over the last several years of a base model PT-76 kit from Eastern Express and PT-76, PT-76 Model 1951 and PT-76B/PT-76B Polish kits from Trumpeter, it is nice to have a good photo reference manual for these vehicles. The book follows the same format as most of the other WWP “Photo Manual for Modelers” books. Conveniently color-coded, the first 57 pages cover the PT-76 and PT-76B in close detail using full-color photos of existing vehicles. The next eleven pages cover the BTR-50PK command vehicle, followed by one pages on PT-76 wheels and tracks and six more pages on BTR-50 details. Next comes 12 pages on the TOPAS variant of the BTR-50 and its details. The next series of photos presents 12 pages on the 3R8 missile and launcher, better known during the 1960s as the “FROG-3". The next 32 pages cover captured PT-76 and BTR-50 vehicles in the Latrun Museum of the IDF, where the captured PT-76 tanks were best known for their “Trojan Horse” use when capturing the Egyptian crossing points on the Suez Canal in 1973. The last section of the book is a South Lebanon Army (SLA) BTR-50 ambulance conversion also at Latrun. It has been modified by a special hatch in the bow for handling litter patients. Two pages of color paintings and three pages of ads for other books complete the book. Overall these are great for modelers who want to add interior details or get accurate exterior detailing on their models.